Question:I have one scanned PDF document which I need to convert into word format for editing. I tried several scanned PDF to word converter but they just transfer image of scanned document into doc format which is useless for editing. Please suggest me a free software which really convert scanned PDF into real doc for editing.It would be better if there are some free online converter as I just convert a few scanned PDF file. Is there such solution on VeryPDF? Answer: When converting scanned PDF to word, you need to use some converter with OCR function or else it will process scanned PDF like image and then convert it to word. When converting scanned PDF to word by some software which does not have OCR function, there will be still image in output word, you still can not edit it. Based on situation, you can have a free trial of VeryPDF cloud based application named VeryPDF OCR Cloud API, by which you can convert images (PDF, TIF, PNG, JPG) containing text into editable searchable text-based documents (PDF, TXT, RTF, DOC, XLS, PPT, XML, HTML) with unsurpassed best-in-marketplace quality. This software is free in some degree as there is no using times limitation but there will be watermark on output. 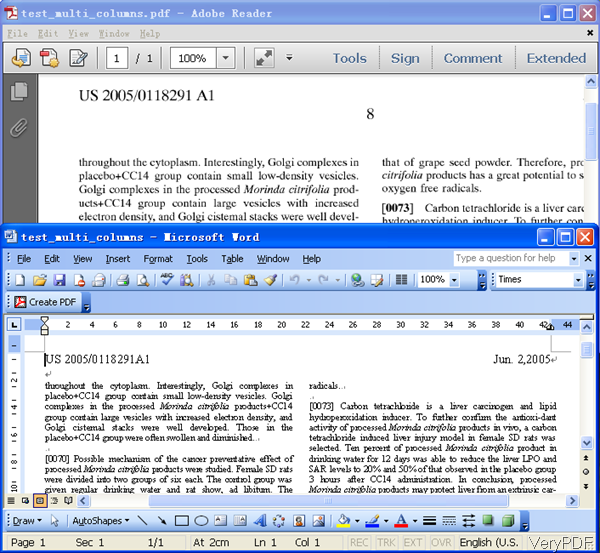 And as cloud based API, you can use it to scanned PDF to word under any kind of computer system. Please check more information of this software on homepage, in the following part, let us check how to use this software. All the VeryPDF API will run the conversion within browser. You do not need to download any third party application, simply one browser is enough. By this above URL, we can convert input scanned PDF file to word by advanced OCR technology. Please note at the end of URL, I added a parameter lang=eng to specify the OCR language. When you use this software to OCR scanned PDF, please check the language in PDF and then specify it in the URL. By this method, this software will launch corresponding language package to process content in it. This software supports more than 50 OCR languages like Macedonian language,Malayalam language, Lithuanian language, Latvian language, Korean language, Kannada language, Italian language, Icelandic language, Indonesian language, Cherokee language, Hungarian language, Croatian language, Hindi language, Hebrew language,Galician language, Middle French (ca. 1400-1600) language, Frankish language and son so forth. By this cloud based API, you can convert scanned PDF to word free online. During the using, if you have any question, please contact us as soon as possible. This entry was posted in VeryPDF Cloud API and tagged scanned PDF to Word. Bookmark the permalink.